“Don’t litter around in the house. Throw it out of the window”. I think that a nation’s view on the world can be measured by what our Moms believe in. I sit in my office room and wonder what to make of that advice. I have 3 differently labeled dustbins one for each kind of waste, a self-imposed ritual that I Got Garbage team – hardworking and bunch of enthusiastic people who have stepped out to make a difference, looks to practice because segregation starts at home! We are all troopers for our Indian upbringing – We can criticize without feeling guilty. We all have a certain respect for rules and authority and definitely try to fit in. We learnt to work with the rules where they are in place, or when we have someone watching over, I try to organize my waste at work, but at home, I just throw it out of my window because my mom said so! I come from a middle class household and never had to deal with what happens to waste after I throw it out. I learnt to “pull through” and “adjust” if it was stinky outside. But I think there was a very important thing that I didn’t learn, which was that if we step out to change it has to be “felt” by every individual. The Garbage Revolutions is what I Got Garbage tries to create, to instill the culture of waste segregation at every level for the larger benefit of the society. Garbage revolutions is something the society awaits to sort their everyday garbage problem. Coming from a generation that believed in complete “Jugaad” (ingenious solution), that used the vegetable waste as manure, that saved up old cardboard sheets for school “project work”, that used the same TV for 15 years and plastered/repaired the remote control and protected the keys with a homemade cover, we have been westernized into a culture of use and throw. We change our mobile phone every year, we use easy to make food, we have become on the go, but we have left the ingeniousness behind to live amidst junk and nowhere to dump! Technology is what this team believes will act as a platform to bring together everybody in the system to have a channelized waste disposal process. It is a series of mini revolutions, from empowering the rag picker to bringing about the change in attitude towards waste disposal in each household. 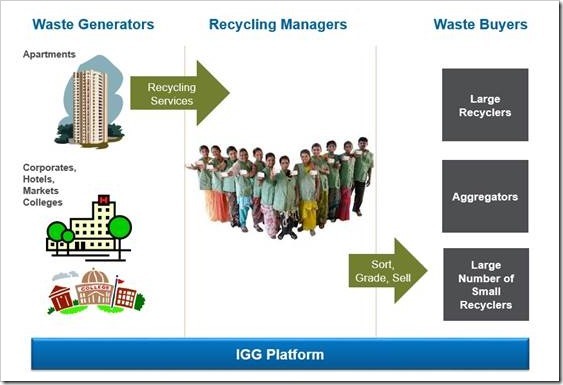 I Got Garbage is a cloud based platform bringing together the waste generators, the managers and the buyers all under one platform so that there is synergy in the process and sustainability in the long run. The IGG platform believes in the rag picker handholding process where they try to empower them and uplift their livelihood. It acts as a successful conveyor belt, passing on ideas and training from the NGOs to the unknown and underprivileged. This creates a system of unity in terms of what is more socially desirable. It brings together people for a cause and has every household involved in making this change. The platform positions a rag picker as a potential recycling manager. I Got Garbage wants to create a generation that is capable of adapting to change. But let’s talk about why we should change or adapt. In the past two decades, Indian middle class has had to deal with globalization. Indians have always lived abroad, but the influx of the culture from abroad is much greater now given the internet and social media. Restless, young and empowered India is beginning to see a new set of ideas and careers. But all this definitely challenges our environment and that’s completely overlooked. What is important is to realize that these turbulences are natural and have to be dealt with for the larger benefit. It is necessary to rewire our traditional understanding of “waste belong out” and “not our problem” to make way for the new blends. Years of living a certain must be challenged to deal with these new ideas. “Kuda Baahar Pheko” (throw the waste out) which also needs to be altered. The little effort that we make today in disposal of our waste goes a long way in creating a livelihood and having a much cleaner environment. Although I Got Garbage provides the platform, idea and new technologies for waste disposal and recycling, it is an initiative for the people and has to be by the people. The need to “feel’ the intent behind this revolution will only make the initiative successful. Come and join the revolution, I got my garbage, Have you? About the Author: The post has been written by I Got Garbage team member Amulya. There is only one problem with it. If garbage is segregated at source then rag pickers will not have any job. It will benefit in every other way but it will also mean end of rag picker job. 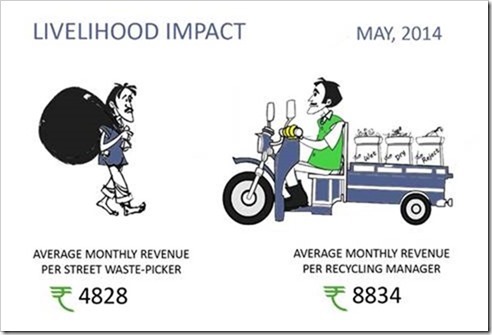 From 4800 to 8800 Rs… I really don’t know if this is a joke or reality, but if this is possible why is the entire country not doing what IGotGarbage is doing??????? This is one great use of technology to bring change in the society. And the idea is commendable, seems like a super-ragpicker will one day come to save the earth. I wish I Got Garbage all the luck but I don’t know if people in India are ready to welcome you. We are so much into ‘out of sight out of mind’ mentality, we dont want to segregate but mix it all and hide it under a landfill.